Hemp bars. No matter how many of them you eat, you’ll still have the munchies. Okay, not quite. But I do wish I could figure out what the heck it is that is making me so hungry today. I can’t stay out of the kitchen and am craving things like granola, bread and cookies. Usually adding a little peanut butter to the mix induces some degree of satiety, but not today. 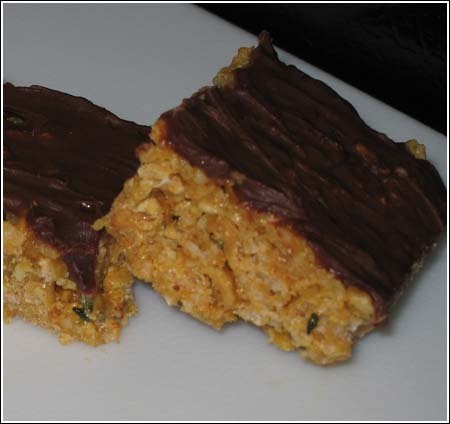 Anyhow, these “Scotcheroo” knockoffs are a good way to fit Omega 3s into your dessert. Consider my directions a suggestion and use your own judgment as to how much more or less cereal you need or what syrup you choose. I used rice syrup, but I’m pretty sure maple syrup would work well. The chocolate on top is not completely necessary, but it’s excellent if you have the time. If you have both butterscotch chips and chocolate chips around, they taste great melted together. 1/4 cup peanut butter (I used Jif) - if you use "natural" peanut butter, you may need to add some brown sugar to get the right sweetness. Line a 9x5 inch loaf pan with Reynolds "Release" foil or use regular foil and spray it with cooking spray. In a mixing bowl, stir together Special K and hemp, breaking up Special K with the back of a spoon so that it is slightly crushed. Stir in salt. In a separate 2 quart, microwave safe mixing bowl, combine brown rice syrup and peanut butter. Microwave for 30 seconds or until soft and hot. Add vanilla, then stir in Special K/Hemp mixture, mixing so that cereal is coated in peanut butter mixture. Scrape into loaf pan and press firmly into a rectangle. Transfer to refrigerator and chill for about half an hour. Remove from pan by lifting foil. Place on a cutting board and cut into bars. Drizzle with melted chocolate or leave as is. Return to refrigerator and let chocolate set. Bars will also firm up a bit more. Makes 6, 8, 12 or 16 depending on what your idea of a bar is. I say, cut your bars large! It is all I know! I blame my mother for that. She always gave us a HUGE piece of whatever she was baking!! And I grew up with the CLEAN PLATE CLUB, a family ritual where you had to eat all on your plate-no matter what! Then the reward was a BIG slab of cake from mom!!! These bars look fab!!! YUM! Correct me Anna, is Hemp derived from the marjuana plant? Maybe that is why you are hungry!! Just kidding you!!! I have a very liberal attitude towards serving sizes. Oh, and I just checked out your blog and it blew my mind — great stuff. I like how you organized it.